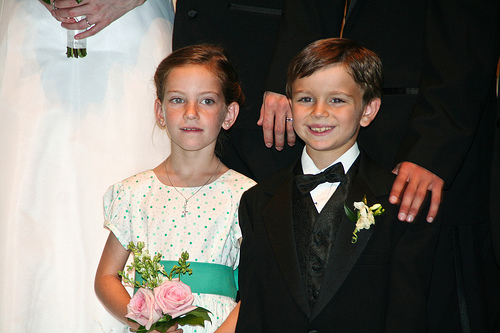 A vintage style can be a great way for a ring bearer to be dressed for a wedding. This look goes particularly well with outdoor weddings but can look great with indoor ceremonies as well. One key component with this look is the choice of a bow tie and a newsboy styled hat. These are available through a variety of retailers and look great with a button front shirt, long shorts or pants and vintage styled tennis shoes. It is a comfortable look full of pieces that the parents will use again. For the bride and groom who are trendsetters and always dressed in the latest styles it would only make sense that their ring bearer be as fashionable during the ceremony. There are several key pieces to creating this look. One is that a bow tie is going to be used again. In addition suspenders are a great way to give a young child some stylish flair. Dress pants, a button front shirt, a patterned pocket square, and oxfords completely take this child from the playground to the pew. 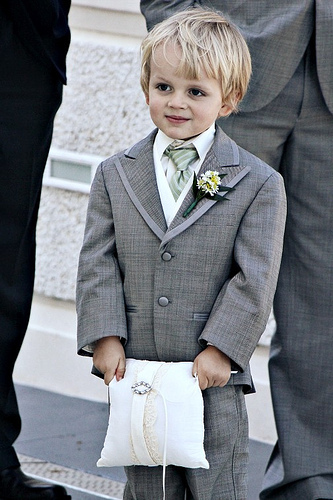 Styling a little guy to look like a gentleman is another trend that is popular especially in the southern US states. This look takes pieces that are created for spring and summer and puts them together in a way that will give the ringer bearer a style and personality while making him look fit for the country club. This ensemble requires a blazer, pants, shirt, bow tie, and flip flops to update it from traditional and boring to tradition with a flair. With barn weddings being so popular it is important to have an idea of how to style a little one who is going to be the ring bearer on the farm as well. With this setting a nice pair of dark washed jeans, cute tennis shoes, a bow tie in a fresh pattern, suspenders, a newsboy cap, and a button up shirt will work perfectly to keep the child happy and able to play when the ceremony is over. Beach weddings are another popular trend where a ring bearer should be dressed appropriately for the weather but still look good enough to be a part of the wedding party. For this type of wedding a blazer and pair of shorts can be perfect with a fancy boutonniere, and a pair of boat shoes. Not only is this look perfect for warmer weather but it also still will look appropriate with any style of wedding party. The trendiest boys will find many of these outfits to not be what they’d choose for themselves. 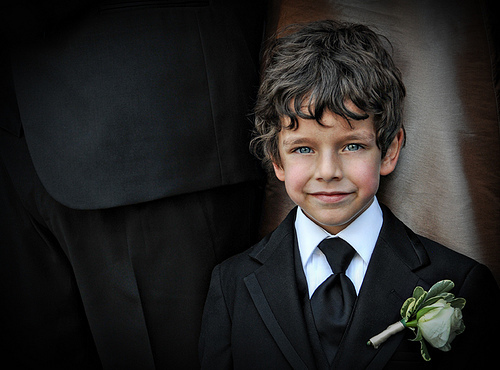 Regardless of your wedding’s style a child can still reflect who he is and look great too. Choosing pieces like a dress vest, long sleeve button up shirt, fun patterned tennis shoes, and pants can help them to look cool while still being dressed up enough to represent in your wedding.